A macerator pump that enables you to install an en-suite — with ease. 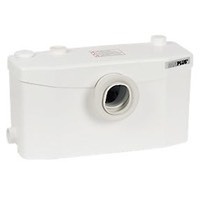 Takes the waste from a WC, a wash basin and a shower/bath and pumps through 22mm small-bore pipework, vertically up to 5 metres or horizontally up to 100 metres or a lesser combination of both. Waste water is drained by gravity from shower, bath, bidet or wash basin to the Saniplus through inlets on either side of the unit. 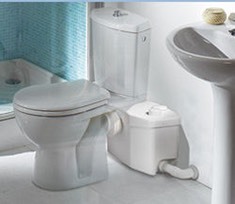 Ideal for a bathroom for the less abled and you have the choice of both sanitary ware and location. H x W x D: 305 x 512 x 200mm. Connects to 22mm discharge pipe.